Despite evidence that dehumanizing language and metaphors are found in political discourse, extant research has largely overlooked whether voters dehumanize their political opponents. Research on dehumanization has tended to focus on racial and ethnic divisions in societies, rather than political divisions. Understanding dehumanization in political contexts is important because the social psychology literature links dehumanization to a variety of negative outcomes, including moral disengagement, aggression, and even violence. 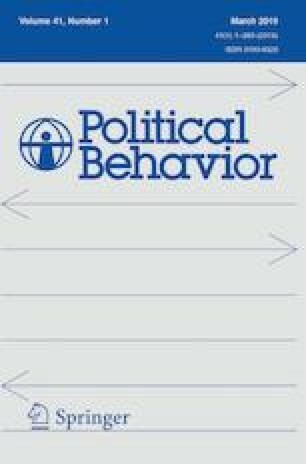 In this manuscript, I discuss evidence of partisan dehumanization during the 2016 U.S. Presidential campaign and demonstrate how a focus on dehumanization can expose new relationships between moral psychology and partisan identity. Using data from two surveys conducted in October of 2016, I show that partisans dehumanize their political opponents in both subtle and blatant ways. When I investigate the correlates of dehumanization, I find that partisans who blatantly dehumanize members of the opposing party prefer greater social distance from their political opponents, which is indicative of reduced interpersonal tolerance. I also find that blatant dehumanization is associated with perceptions of greater moral distance between the parties, which is indicative of moral disengagement. These results suggest that dehumanization can improve our understanding of negative partisanship and political polarization. An earlier version of this manuscript was presented at the 2018 Midwest Political Science Association meeting. Thanks to Tiffany Barnes, Grace Deason, Mirya Holman, Ngoc Phan, Jane Sumner, and Caroline Tolbert for their comments on an early draft of this manuscript. Replication materials and appendices are available at https://doi.org/10.7910/DVN/K1RIGM. The online version of this article ( https://doi.org/10.1007/s11109-019-09545-w) contains supplementary material, which is available to authorized users. Colvin, (2018, May 18). Trump says he’ll keep calling gang members ‘animals,’ despite uproar. Retrieved from https://tinyurl.com/yda4rmsp. Gramlich, J. (2017, December 19). Far more Americans say there are strong conflicts between partisans than between other groups in society. Retrieved from https://tinyurl.com/y7vmrd8v. Kludt, T. (2016, Sept. 29). Harry Reid: ‘Trump is the GOP’s Frankenstein monster.’ Retrieved from https://tinyurl.com/y9h24yam. McConnell, C., Y. Margalit, N. Malhotra, and M. Levendusky (2017, May 19). Research: Political polarization is changing how Americans work and shop. Harvard Business Review. Retrieved from https://tinyurl.com/yavtd2jp. O’Sullivan, J. (2016, July 20). Trump advisor says Clinton should be ‘shot for treason. Retrieved from https://tinyurl.com/hxltv7a. Reilly, K. (2016, Sept. 10). Read Hillary Clinton’s ‘basket of deplorables’ remarks about Donald Trump supporters. Retrieved from https://tinyurl.com/zx996cl. Tatum, S. (2017). “Eric Trump: Democrats in Washington are ‘not even people.’” Retrieved from https://tinyurl.com/ybfwvb9k.